Warner Springs and Murrieta farm raises pastured chickens, rebuilds healthy, regenerative soils and grasslands, and coexists with wildlife. This sentiment, together with a variety of husbandry practices to meet the farm’s stewardship mission, has enabled Pasturebird and sister location, Primal Pastures, to become Southern California’s first farm to achieve Certified Wildlife Friendly® status. Certified Wildlife Friendly® recognizes farms and ranches committed to regenerative practices that enable wildlife and livestock to coexist. The farm is working to restore perennial grasslands. It uses managed, multi-species grazing practices to improve soil. It conserves wildlife corridors, and relies upon proactive, humane practices to deter predators, among other key attributes. Along with peers around the globe, Pasturebird and Primal Pastures are part of a progressive wave of agriculture that models the critical role of farms and ranches in sustaining wildlife and habitat. The farm’s efforts have been noticed by the Los Angeles Dodgers and the Lakers, both of which have accounts. “Pasturebird’s commitment to transparency and raising birds the way they were meant to live is truly inspiring,” says chef Alan Latourelle of Wolfgang Puck, another satisfied customer. Kitchen workers from the hospitality group’s Southern California staff recently toured the farm, gaining first-hand experience of what Pasturebird terms simply “real chicken.” Inspired by renowned grass farmer Joel Salatin of Virginia, Paul Greive and his family are committed to creating a scale-alternative to factory farming that cares for the land, the animals and consumers’ health. The farm started simply enough, 5 years ago, from the family’s search for healthy food for its own use: “We were paying a bunch of money for labels, but not good food,” explains Paul. “We wanted to eat meat that was not bad for the environment or our bodies,” he explains. “We couldn’t find what we were looking for.” And, so what began with an order of 54 chickens for personal use turned into a vocation for 2 generations and multiple branches of Paul’s family. 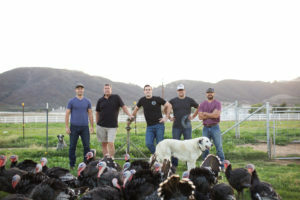 Pasturebird, a wholesale operation opened in 2015, builds upon the success of Primal Pastures, the family’s direct-to-consumer farm in Murrieta. Livestock guardian dogs are integral to the farm’s ability to coexist with wildlife. While predator losses were significant in the farm’s first true commercial year, the family quickly realized the use of lethal control “didn’t jibe at all with what we were doing,” says Paul. Rather, “we were working to “heal the land, heal the soil, and participate with nature.” Today, the farm raises its own Anatolian Shepherd/Great Pyrenees mix guardians. The dogs help to protect the flock, which is moved to fresh pasture daily in open-air, floorless chicken tractors. The farm vision includes having its operations become carbon-neutral in a few years, by offsetting the energy put into tractors and other equipment through its soil building activities. Primal Pastures (direct to consumer) and Pasturebird (wholesale) farms raise pastured chicken in Southern California. 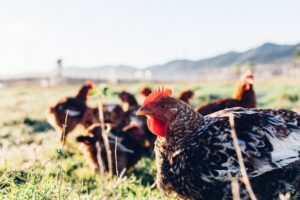 By rotating the chickens to fresh pasture every single day, the farm’s chicken is not only healthy and delicious but also goes beyond sustainability to rebuild healthy, regenerative soils and grasslands.